There is no need to wear boring old fashioned dress shirts when you have exciting looking dress shirts by Fratello at your disposal. 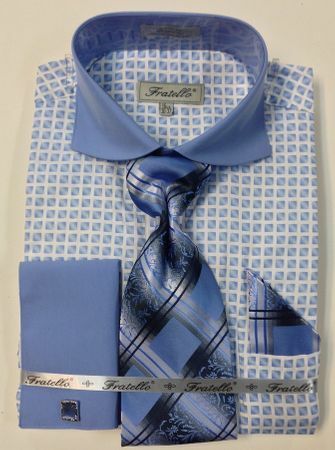 Fratello brand dress shirts reflect fancy Italian design for the man who likes being seen and complimented. This head turning blue square pattern shirt and tie set comes just like you see it. The collar is a spread collar with an extreme cut and the cuffs are french style. Tie and hanky set comes with it. Made of cotton blend fabric.